Shared by iamanoffering on Flickr. I came from Migdal. A town widely known for its fish – a special coincidence I hardly consider chance. After all, Jesus called his disciples “fishers of men” – I was one of his fishers. I was one of those who fished for humanity with Jesus’ truth. I proudly declared my role as a fisher of men in my very name. I was Miriam of Migdal – that’s what he called me…. I was vulnerable in even more ways though than just being without a family. You see…I was possessed by demons – not just 1 or 2, but 7. I suppose you could say I was completely, totally possessed. After all the number 7 has special meaning to my people, the Jews. Seven means totality, completeness….Well, whatever it meant, I was filled with unclean spirits. And those demons were considered contagious. Everyone steered clear of me when I came near. Now mind you – demon possession didn’t mean I was somehow promiscuous. Don’t – please don’t – believe those stories you hear. After all how many men and boys were also filled with spirits? And yet – have you ever heard someone call them promiscuous?! I had heard about a healer who lived in Capernaum. He hadn’t grown up there – he had grown up in Nazareth. 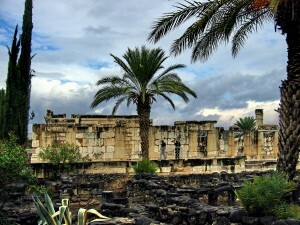 As the story went, the people of his hometown had driven him out…and so he was now based in Capernaum. The more I looked at my hopeless life, the more I realized I had nothing to lose. So one day I took off from Migdal and walked the 10 long miles to Capernaum. The journey was filled with rough paths, and rocky roads. Being demon possessed and wearing tattered clothes, I sought him out in Capernaum. In that very first encounter, I knew he was different. In that moment – the very forces of uncleanness attacking my soul were confronted with power of God’s spirit. I experienced….I experienced the power of the Holy Spirit! It was more than that though. I heard his preaching about the Kingdom of God. He said it – the Kingdom – was coming, and I rejoiced. My people – God’s chosen people – had long awaited this moment. And finally – that moment when the in-breaking of God’s power, and the coming of his justice and mercy – it was here! Shared by Bon Adrien on Flickr. In that moment, I knew being Jesus’ disciple was my calling. I moved permanently to Capernaum, and quickly became one of the inner circle of disciples. Does that surprise you? That a female could be a disciple? A part of the inner circle of Jesus’ disciples? I was quickly and easily accepted as one his disciples. After all, Jesus had regularly said that he used God’s spirit to drive out demons – my demons – and his ability to do so? That just proved that the Kingdom of God was already here. I was living proof of God’s power…of Jesus’ special connection with God….of the Kingdom of God which was arriving. I was not wealthy as other women disciples like Joanna. After all, when I left Migdal for Capernaum, the only possession I had were the demons that had once tortured me. But I soon became one of his followers and friends. Those who heard and shared his teaching. Those who supported him. Those who dined with him. Some people challenged Jesus about his choice of friends and dinner companions. They critiqued him, calling him a friend of sinners and tax collectors. And those who critiqued him included us unattached women as part the “sinners” group. But do you know what he said? He defended his choice of friends! But more than that, he defended us! In fact he even said that we would go into the Kingdom of God ahead of those who, society considered righteous! I suppose hearing Jesus teach, being part of his inner circle, being defended by him, and being living proof of the Kingdom of God’s arrival, I walked boldly. I knew Jesus and his mission. I never fully understood it, but as we approached Pesach that final year, I sensed something was different…I sensed….that somehow God was ready to do something new. I thought that his teaching about the Kingdom of God, his physical healing throughout Galilee, the transformation of life I had witnessed…they were all leading to something. But I didn’t know what. And then….then Jesus kept speaking of his death. Could – I asked myself – his death somehow become a vehicle of God’s presence? I thought so. But I didn’t dare utter it. Even the thought seemed blasphemous. I can’t articulate why, or how, I knew…but I knew his death was soon coming. And I knew a body must be prepared for death and burial. So one evening, just days before everything came crashing down, as Jesus dined with others in Bethany, just a few miles from Jerusalem, I anointed him following my people’s traditions. That alabaster jar I used contained special perfume – expensive perfume – normally only used for those who were great. But after what I had seen and experienced – who else could possibly be greater? My actions made people angry. Now that I think about it, it seems Jesus often made others angry. But once again he stood up for me. He defended me from those who scoffed and taunted. “Leave her alone!” he said. He approved of my bold action, calling it fine and beautiful. He said I was preparing his body for burial…. And then I knew – my hunch, my understanding about his coming death – it was right. It didn’t make sense, but it was right. And then he said something else…it was years before I truly understood this. He said that whenever and wherever his good news would be shared, what I did would also be remembered and told. 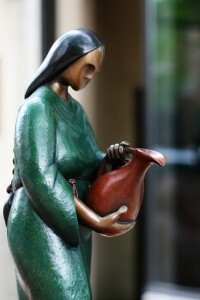 This is the second of a 3-part, first-person series on Mary Magdalene (you can read Part 1 here). While creative license has been taken with some of the details of the account, much of what is included in the series is factual. Mary Magdalene’s true story – rather than the fanciful tales of prostitution, holy bloodlines, and secret marriages – is fascinating and valuable itself. As the Church, we need to rediscover our history, particularly of great women who have been sidelined or mythologized, but who were once known as the “Apostle to the Apostles”!